Excel templates are a great way for a business to sore data about its finances. Both business managers and individuals can also keep track of income and expenses over a long period of time. 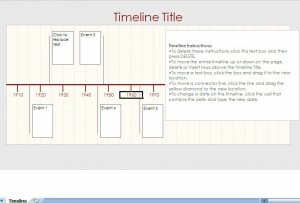 An Excel timeline helps people really see their progress over time. This can be an eye-opening experience. Understanding patterns with income and expenses makes it easier for people to make important changes. Simply balancing a checkbook can not produce such unique charts, graphs and ways to view information. Anyone that wants to stay on top of their finances and truly save big should use Excel templates to craft an up-to-date timeline.